Submit your application to UNISIG’s engineering group, and our team will review your requirements, discuss any remaining questions, and propose a detailed solution along with automation or additional options to optimize the process. Application time studies are provided, when applicable, and UNISIG’s sales team is available to review the proposal and answer any further questions you may have. Consider your part and production requirements, and search UNISIG deep hole drilling machines online. You can search by part and hole parameters, by tooling or process type, and by industry segment. For customers in need of an expedited lead time, Express Delivery machines are available to start your drilling production sooner, with some customizability for your application requirements. Our experienced sales team is available for a detailed proposal review and to address any additional questions you may have, and representatives may be involved to support the sales process. Customers are also invited to visit our facility to learn more about our engineering and manufacturing process, view our resources and capabilities, and meet additional technical staff that will be involved in your machine purchase. For additional confidence in UNISIG’s capabilities, a process development package can be purchased to ensure that your application will be drilled to your specifications. Upon receipt of the purchase order, your new deep hole drilling machine is refined in engineering, and enters the manufacturing process, which includes a majority of components that are manufactured in-house. Upon completion, we typically host customers for a run-off in our facility, allowing operational training and a detailed understanding of the equipment and tooling. New machine owners leave with the knowledge to begin production as soon as installation is complete, and the skills to develop their manufacturing processes for maximum efficiency. After the run-off and machine acceptance, machines are shipped and professionally installed in customer facilities by trained UNISIG technicians in cooperation with facility maintenance staff. The machine is precision aligned, tested, and the machine run-off and operator training is continued on site, resulting in a capable deep hole drilling system with confident operators. 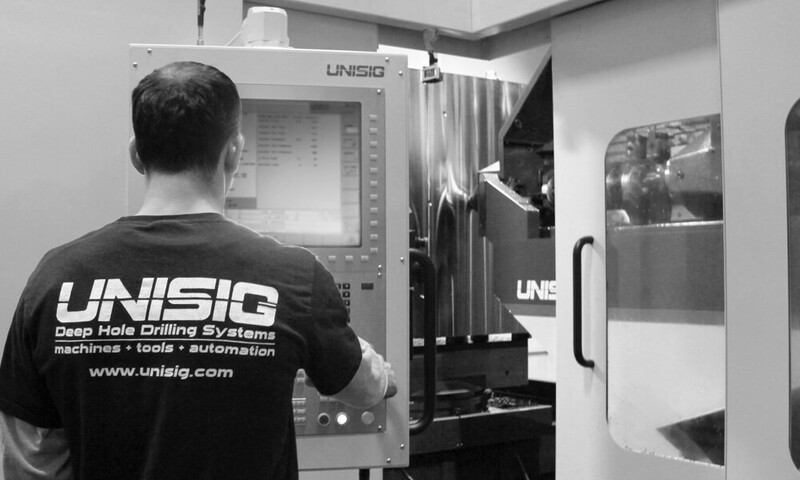 UNISIG provides support after installation, with an experienced network of engineers, technicians, and trained and certified service groups around the globe. UNISIG service teams offer support services such as field service, preventative maintenance, and advanced training. Enter your application details for an engineering review and proposal for UNISIG deep hole drilling solutions.